Atlético de Madrid won the third Europa League of their history with a 3-0 victory against Marseille, this Wednesday at Lyon, thanks mainly to a double by Antoine Griezmann. The French attacker, elected "Man of the Match" by UEFA, forgot the media storm in which he is involved for his possible move to Barcelona and was the hero of the night with his two goals (minutes 21 and 49). With everything decided, Captain Gabi Fernández (89) achieved the third. Atlético breaks a drought of almost four years without titles, since the Spanish Super Cup in 2014, and continues with a full of finals won in this competition, after the conquered in 2010 in Hamburg and in 2012 in Bucharest, the latter already with Diego Simeone as a technician. 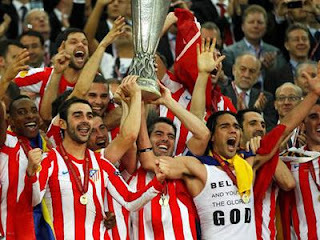 With the Argentine coach following the clash from the stand to be suspended and King Felipe VI in the box of authorities, Atletico could meet again with the celebration in a final, turning the page of its two painful defeats in the Champions League in 2014 and 2016, in both cases by very little and in front of its neighbor Real Madrid. Marseille, who had to change their captain Dimitri Payet due to injury, lost a final in the Europa League again after the other two (1999 and 2004), and France will still not be able to release its record in this competition. Pushed by its volcanic hobby, which filled its bottom with smoke during the game with a massive ignition of flares, the Marseille began as a hurricane. Barely in minute 4, Payet opened for his partner Valère Germain, who in a one-on-one with Jan Oblak sent high with everything in favor. Atletico began to wake up from its lethargy of the first quarter of an hour with a deflected shot from Koke Resurrección (15), who lived up to his name and put the Atlético players on their feet. And then came the help of the defense of Olympique: a poisoned ball from goalkeeper Steve Mandanda for André Anguissa, who controlled badly, was taken advantage of by Captain Gabi Fernandez to steal the ball and send a pass that left Griezmann hand in hand with the rival goalkeeper, to set the 1 to 0 in the 21. The goal, and the way in which it was produced, damaged the Marseille mentally, which suffered the second blow to the chin in the 32nd, when its captain Dimitri Payet suffered from a muscular problem and was replaced by tears by the young Maxime Lopez. In the 39, the Uruguayan Diego Godín tried to obtain the second one, but his shot overlooked Koke's center went wide. Atletico already killed the game at the beginning of the second half, when Saúl Ñíguez won a ball divided by overhead, Koke Resurrección drove and sent a pass to his right for Griezmann, who almost from the edge of the area went straight to the goal rival and crossed away from the reach of Mandanda. Atlético closed the party with the third, in the 89th, in a great collective play in which Koke ended up sending the second post so that Gabi, first, put the final 3-0.